Quality of life. Peace of mind. 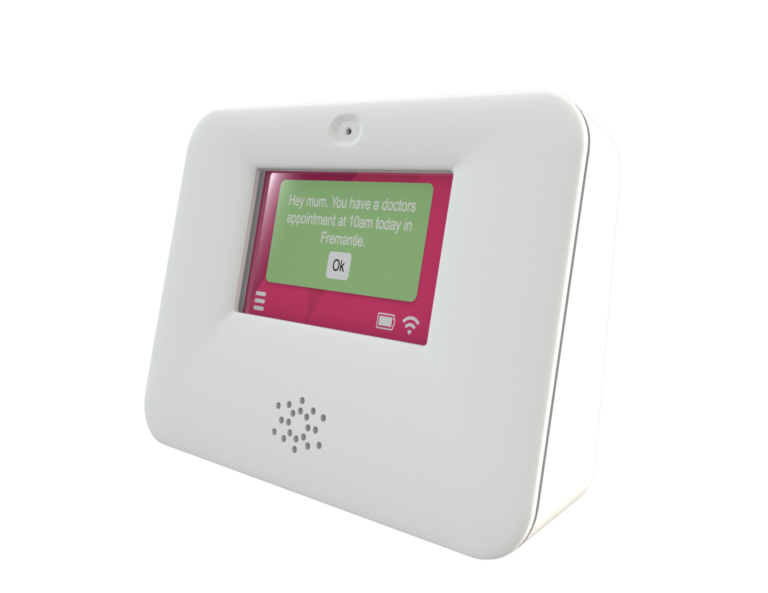 InteliCare is an innovative solution designed to enable seniors to safely remain in their own homes for longer. InteliCare turns the home into a ‘smart home’. It gets to know the household routine and can alert family or other caregivers if something is out of the ordinary. For example, InteliCare understands normal get up time, meal preparation and sleep patterns. Understanding these routine activities enables InteliCare to detect potential issues and send notifications and alerts to family members or carers, allowing them to check-in if needed. InteliCare works 24/7 to keep seniors safe. Unlike duress pendants that need to be worn at all times, InteliCare can raise issues or concerns automatically. The InteliCare App keeps everyone informed of any events and lets everyone see who is responding to notifications. InteliCare has been designed to be installed quickly and easily in any home with no modifications or electrical works required. The tile view quickly shows you what InteliCare has detected. Tap on ‘Activity’ for a detailed view of InteliCare insights, sensor status and activities details. For example, here you can see a drop in daily activity – this could be an indicator of illness or another issue. By tapping on climate, meals or domestic, you can quickly see the most recent information about these topics. Actions are recorded for future reference. In the case where the system detects a serious issue such as failure to get out of bed or a duress pendant activation, InteliCare alerts carers and/or family through push messages to your smartphone as well as SMS alerts. 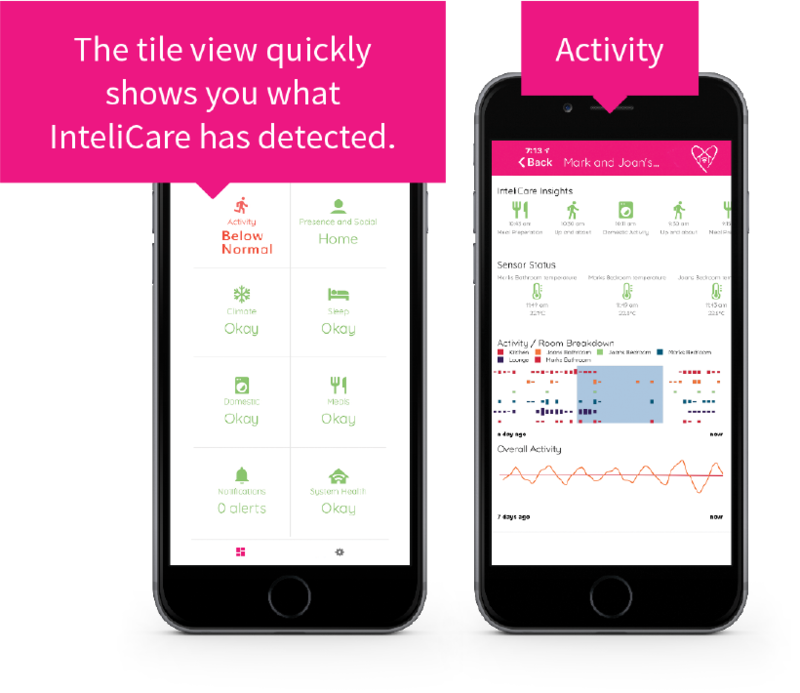 Opening the InteliCare app will provide extra detail for you to assess the seriousness of the issue. If the person is unable to answer the phone, the app has an intercom feature to enable audio into the home via the InteliHub built in speaker and microphone. Ageing often brings with it new challenges to health and independence. The conventional solution, often at the prompting of family, is to consider a costly move into a retirement community or an aged care facility. This can be a difficult decision – moving out of your own home can be emotionally stressful, particularly when you want to retain your independence and are confident in your ability to take care of yourself. InteliCare allows you to stay safely in your own home for longer while providing your family peace of mind. If there is an issue, you can feel confident that InteliCare is looking out for you and will let family or carers know. As a family member, you understandably have concerns as to how long a loved one can remain safely independent at home. 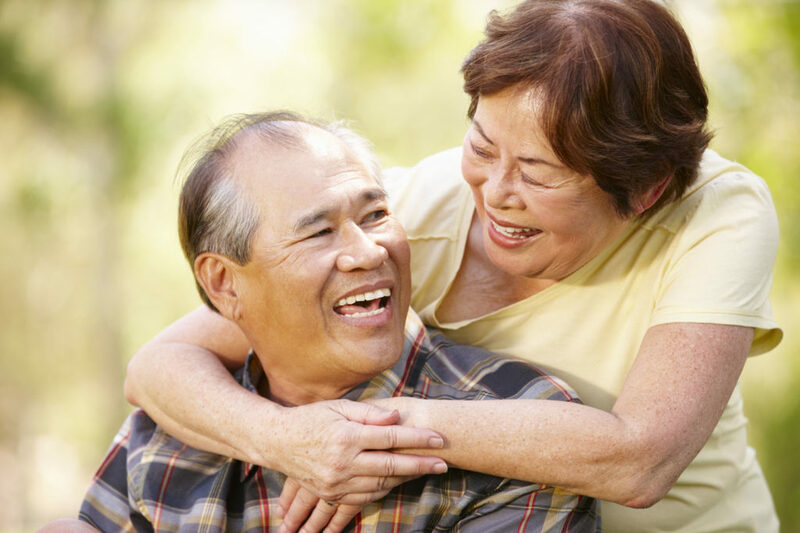 Many seniors would prefer to remain in the familiar surroundings of their own homes. The subject of a transfer into an aged facility can be a source of angst and financial concern for the whole family. Installing InteliCare into the residence is a simple task that one of our expert teams can undertake with minimal disruption. Once complete, you can check that your loved ones are OK as often as you wish via our easy-to-use mobile application – and if something unusual does occur, you will be alerted via our InteliCare App and can take the appropriate action. If the household is following the normal routine, InteliCare provides reassurance by sending an “all OK” message. If InteliCare senses something is wrong, such as lower than normal activity, it will send a pop-up notification for you to check in. The tile view quickly shows you what InteliCare has detected. Tap on Activity for a detailed view of InteliCare insights, sensor status and activities details. For example, here you can see a drop in daily activity, this could be an indicator of illness or another issue. By tapping on climate, meals or domestic you can quickly see the most recent information about these topics. What if InteliCare detects a serious issue? 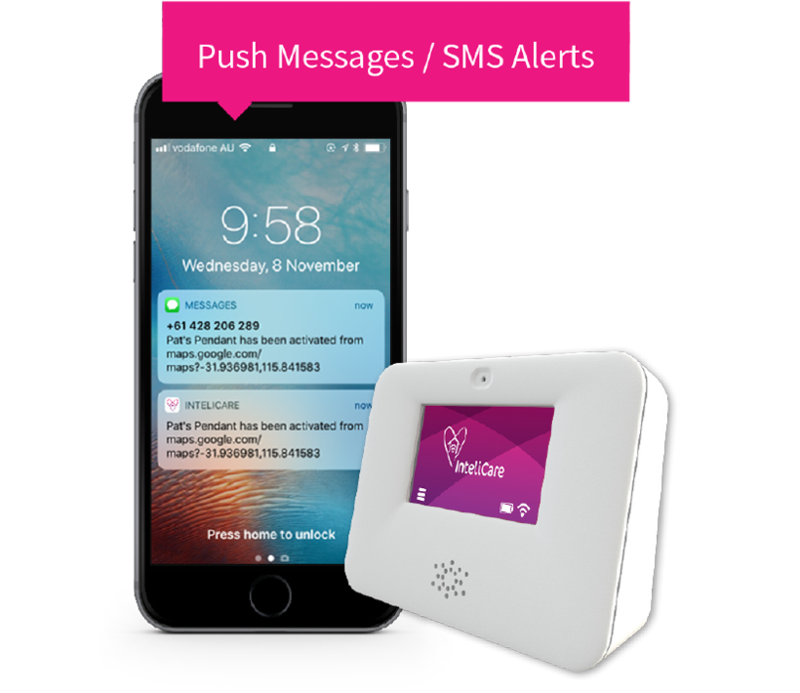 In the case where the system detects a serious issue such as failure to get out of bed or a duress pendant activation, InteliCare alerts family or a nominated carer through push messages to your smartphone as well as SMS alerts. Opening the InteliCare App will provide extra detail for you to assess the seriousness of the issue. If the person is unable to answer the phone, the app has an intercom feature to enable audio into the home via the built in InteliHub speaker and microphone. How does InteliCare keep me informed? Keeping family informed that all is OK as well and making them aware of concerns and incidents is an important factor. Lack of information is a major cause of worry for any family member. What else can InteliCare do? The InteliHub, the smart sensors and the InteliCare App work together to provide reassurance that everything is OK with their loved one and that should there be a concern detected, the system will let them know but it can also be used to communicate into the home. The App has a messaging feature that allows for app users to send text messages to the colour touch screen. These may be simple personal messages, reminders or appointments. The InteliCare solution has been designed to be enhanced over time. Like apps on your smartphone, new features and updates will be sent out automatically. New features such as hydration reminders when the system detects a hot day is an example of how the system will be made smarter in new updates. What is installed in the home? InteliCare has been designed to be installed quickly and easily in any home with no modifications or electrical works required, all we need is an WiFi Internet connection. If one is not available, an optional data plan can be provided via the Telstra network. The components of the solution include, the InteliCare hub, smart rooms sensors, smart power sensors and door sensors. All the components have been selected to be as discrete as possible. The solution is as unobtrusive as a home security system. The InteliCare hub comes equipped with a sensitive microphone and a speaker. In the event, you need to call for assistance, your family will want to contact you to let you know help is on the way. If they call and you can’t get to the phone, InteliCare provides the option for approved App users to activate “Intercom mode” so you talk and let them know what’s going on. The smart rooms sensors provide InteliCare with information on activity within a room as well as environmental conditions such as temperature, humidity and light levels. The other sensors provide the system with information to allow InteliCare to model what routine domestic activity is like within the home. InteliCare comes with some additional optional components to enhance safety within the home. This includes a discrete duress button that can be worn as a pendant. InteliCare can also use its built-in intelligence to automate safety within the home. Trips and falls are a major cause of injury for ageing people with most happening during late night visits to the bathroom. InteliCare can use smart home intelligence to detect movement and activate low level nightlights to illuminate trip hazards without straining the eyes. Where do the sensors get installed? InteliCare sensors provide coverage throughout the home, the exact location and type of sensors are based on a discussion with the resident, family and careers. A typical install is shown below. Keeping family informed that all is OK as well and making them aware of concerns and incidents is an important factor. Lack of information is a major cause of worry for any family member. InteliCare notifications and alerts are sent to all nominated (and approved) carers. Where a carer responds to a notification or alert, the InteliCare app provides the ability to record the action taken and provides that update to all other approved carers. In this way, everyone is informed and aware of events and who has responded. “With all three brothers working full time the burden of having to look after our 87-year-old mother had started to become a reality. We had gotten to the point whereby we had discussed the who, when, where and how of what we would do should mum become vastly more dependant. “Fortunately, mum’s pretty good physically for her age. Sure, she’s a cancer survivor, suffers haemophilia, arthritis, diminished sight, has a pacemaker and has only just gone through a Carpel Tunnel operation, however this doesn’t stop her from enjoying a reasonable lifestyle. Well, that is aside from the fact that by virtue of her living alone in a retirement village and with all three children situated at least 15 to 20 minutes away, it concerns her tremendously. So much so that almost on a daily basis she says she won’t be around for much longer, that she can’t do those things she has always wanted to. And so it goes. “Or at least this is how it was until we had an InteliCare monitoring system fitted to her unit. The difference in mum’s demeanour is palpable, and she is now genuinely loving life. She claims she now has a guardian angel looking over her shoulder. Honestly, the fact that she knows people are watching (statistically speaking) has made such a difference, it is truly amazing. Providing a solution that supports an ageing person to retain their well-deserved dignity and comfort though remaining at home for as long as possible. Intelicare is available through leading home care providers and retirement living / life style villages. Ask your provider if they deliver InteliCare enabled services or contact us direct for more information on how to get InteliCare through our partner network.